CUSTOMIZE YOUR NORMANDY PRIVATE TOURS. 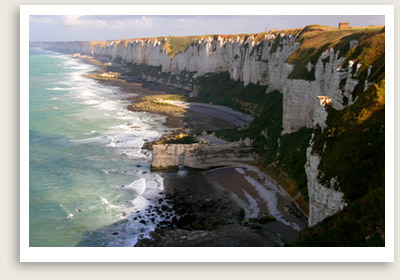 NORMANDY TOURS CUSTOMIZED TO INCLUDE THE SITES OF INTEREST TO YOU. Exceptional Normandy private tour guides for our discerning clients and VIP clients. Normandy Private Tour Includes: Our private tours of Normandy include private tour guide, roundtrip private door-to-door transportation, taxes, tolls and parking. This private D-Day tour in Normandy begins at Pointe du Hoc, one of the Germans’ strategic fortifications along the Normandy coast. (A command post here is now open.) The task of taking Pointe du Hoc fell to 2nd Batallion of Rangers commanded by Colonel James Rudder. On June 6, 1944, Rudder and his Rangers accomplished a memorable feat of arms on t he summit cliffs on June 6, 1944. Your private tour of Normandy will proceed to Omaha Beach, the site of a devastating battle where thousands of American soldiers lost their lives. Lunch break will be by or near Omaha Beach. After lunch your private tour of Normandy continues to the American Cemetery and the Visitor Center in Colleville-sur-Mer, a short drive away. You will have time here to pay homage to the soldiers’ graves and tour the visitor center, which will introduce you to the human stories and military maneuvers of D-Day through photos, films, interactive displays and artifacts. A Tour Variation: To include Arromanches (British sector) in the tour, skip the Visitor Center at the American Cemetery or opt for a longer tour. In Arromanches, you will stop at a viewpoint at the top to see the artificial port on the sea and enter a museum (entrance fees applies) to see a 360-degree film about the allied forces first hours on D Day. Questions, please inquire.